After having to deal with Mumbai traffic for quite a while now, I honestly believe that hatchbacks are ingenious. They do almost everything you expect of a car in city conditions, with the added benefit of them being easier to drive, park and live with. But we've got so many of them in so many different segments that it can get quite confusing to make up your mind on just which one suits you best. 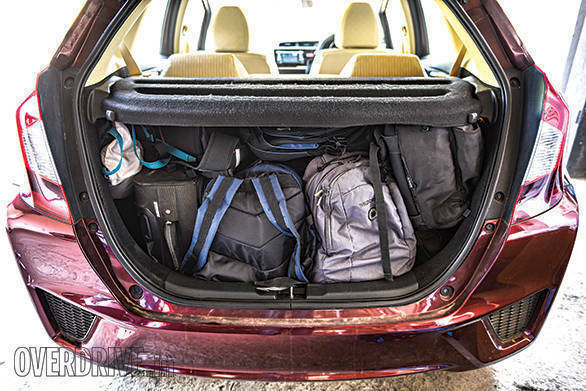 And that's where we come in with our ultra, mega, super hatchback comparo of the year! What we've gone and done is get 10 hatchbacks across multiple price points and pit them against one another. We've tried to focus on the newer products within the space, so this means we've got cars right from the entry-level segment like the Tata Nano AMT and Renault Kwid to premium hatchbacks like the new Honda Jazz and Maruti Suzuki Baleno. But when I say we pit them against one another, I must make it clear that these weren't the conventional tests we usually do in our comparos. We devised 11 offbeat tests that are fun yet relevant to real-world situations. We also managed to bring some people from outside OVERDRIVE's core testing team to give us some perspective on what you, the buying public, feel about each car. Obviously, we couldn't perform these tests on public roads because that would be illegal and a serious nuisance. We needed a private track of sorts that had enough space to park 10 cars and then more for us to act a little silly with them - err test them. Gautam Singhania, the chairman and MD of the Raymond Group, has a private drift track in his headquarters in Thane. That would suit us just fine! A few calls were made, and he was more than happy to let us use his track for two days. With that set, it was track time! The first test on our list was to check cabin room. If this were one of our regular comparos, we'd have gotten out our measuring tapes and noted down how much legroom and kneeroom each car has. But in the real world, no one's got the time or patience to do that. A customer would just squeeze five people inside and see how they fit. So that's just what we did. We got five people of different sizes - tall, broad, short and a couple in between. 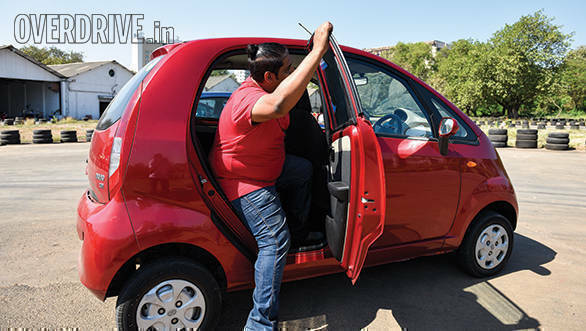 In every car, we got resident BFG Lijo Mathai, who's 6ft4inch tall, to sit in the driver's seat and Vivek Chavan, who is a little taller than average but not a big guy, to sit in the front passenger seat. Donald D'Souza, the broadest of the lot, sat at the back, while Pradeb Biswas and Sohini Dutt squeezed in with him. To help establish a winner, I asked them to score each car on 10, and I calculated the average. I'll admit, this first fun test was more fun for those standing outside and "evaluating" than for the five people sitting inside the car. Unsurprisingly, the Honda Jazz came out with top honours in this test. All five passengers were most happy to squeeze themselves into this car considering how much kneeroom and shoulder room it had even with Lijo pushing the driver's seat all the way back (the Honda Jazz seat doesn't offer excessive travel). It managed to get an average score of 9.2 out of 10 from the passengers. The Maruti Suzuki Baleno stood second, scoring 8.3, while the Toyota Etios Liva, which is a segment lower, came in at third with 7.6 points. That's a marginally better score than the Hyundai Elite i20's 7.4. The entry-level cars, apart from being the most entertaining to watch, also unsurprisingly scored the least. The Maruti Suzuki Alto 800 scored the highest among them with 5.4 points, thanks to better shoulder and kneeroom than the Renault Kwid and Datsun redi-Go. The Tata Nano did score an 8, but that's only with four people in the car as it doesn't have a seatbelt for the fifth. So as a 4-seater, it does very well! The point of the ingress and egress test was to find out which car was easiest to get in and out of. For instance, the seats on some cars are very low, forcing you to bend your head and back more than what is deemed comfortable. Additionally, some door openings aren't as big as one would like, which means you'll have to lift your legs up quite high while getting inside. Now with the average-sized person, finding any differences between the cars would be a bit difficult. Enter Lijo and Donald, again. They were made to sit in the rear seat and the driver's seat of each car, and score each one on 10. The winner here was the Honda Jazz, scoring an impressive 9 points. Honda's "man maximum, machine minimum" philosophy is clearly the way to go. The wide door openings and decent seat travel meant Lijo's long legs didn't get stuck at the door sill and he didn't have to bend his neck too much. Donald was also quite comfortable getting in and out. Tied for second place, with 8 points each, are the Maruti Suzuki Baleno, Hyundai i20 and - wait for it - the Tata Nano! The Baleno and i20's seating is a bit lower than in the Honda Jazz, which means entering and exiting the vehicle is a little more inconvenient. The Tata Nano, on the other hand, has higher seats, excellent headroom and a decent amount of seat travel. This means you can almost slip in and out of the car, barely having to bend your head or knees. The worst of the lot, however, was the Datsun redi-Go. Although it did have better headroom than the Maruti Suzuki Alto 800 and the Renault Kwid, the limited amount of front-seat travel made it quite uncomfortable for Lijo and Donald. The rear seats on both the Renault Kwid and Datsun redi-Go were quite crammed, while the Alto 800 has a very low seating position. 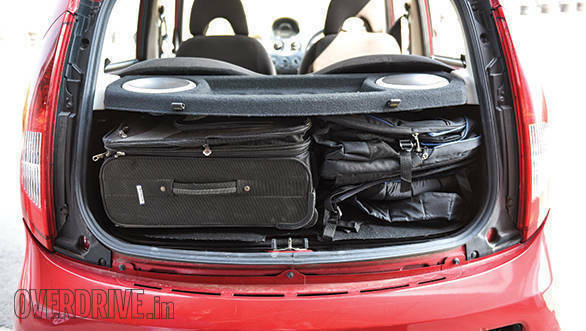 Which car can hold the most luggage? What's as important as fitting five people in a car comfortably? Fitting their luggage! In cities like Mumbai, where people have barely enough space to park one car, owning two cars - one for the city and one for family vacations - is quite impractical. Keeping that in mind, hatchbacks are being designed to be all-rounders. A very important factor to consider if you frequently go on road trips with your family or friends is boot space. For this test, we lined up bags of different sizes and assigned each one a certain number of points. The biggest suitcase held 10 points, the next one 7 and then smallest suitcase was worth 5 points. There were two sizes of backpacks - a big camera bag worth 3 points and a regular backpack worth 2. There were also the foldable camping chairs, which were worth 1 point each. 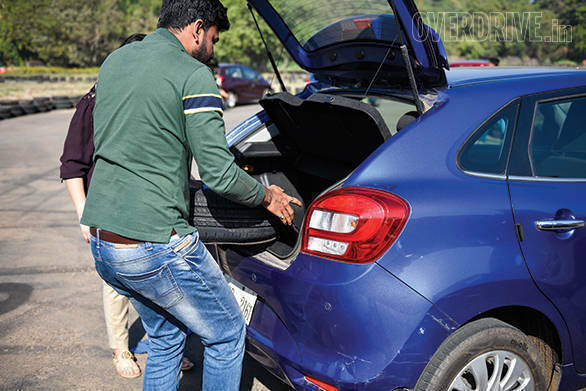 The Honda Jazz and Maruti Suzuki Baleno won this test with a score of 35 out of 35 points after they gobbled up all the bags we had. In fact, we had to go around looking for more backpacks to fit inside the large boots. There was no doubt that the Honda Jazz with its broad boot, a low loading lip, would score the most here. 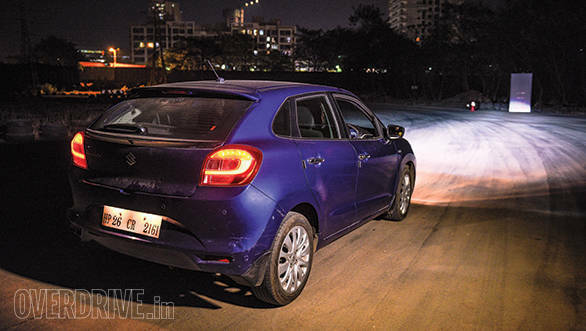 But the Maruti Suzuki Baleno really surprised us. The boot, although not very broad, is quite deep. But that does mean it has a high loading lip, making it quite inconvenient to pack up when compared to the Honda Jazz's almost-flat loading lip. Another surprise in this test was the Renault Kwid. It scored 28 points, which is more than the Ford Figo and Tata Tiago. It has quite a wide boot and a low loading lip compared to the Datsun redi-Go's narrow and relatively deep boot. The Tata Nano was unsurprisingly the worst here, with a score of just 8. But I guess it's an improvement over the first-generation Tata Nano, which didn't even have a boot. Which car is it easiest to change a flat tyre on? A flat tyre is not a very common occurrence for most people. In fact, it's so uncommon that most car owners either don't know where all the tools are located, or even worse, don't know how to change a flat tyre at all. This test is especially for these people. It is meant to find out which car is designed most ergonomically when it comes to changing a tyre. The test is simple, two people work together to swap a tyre and the car for which the least time was taken, wins. Since most of them actually didn't know how to change a flat tyre, I gave them a demonstration with the Renault Kwid, which took me 12min 15s. With the clock ticking, the teams scurried about trying to locate the tools and go about changing the tyre. 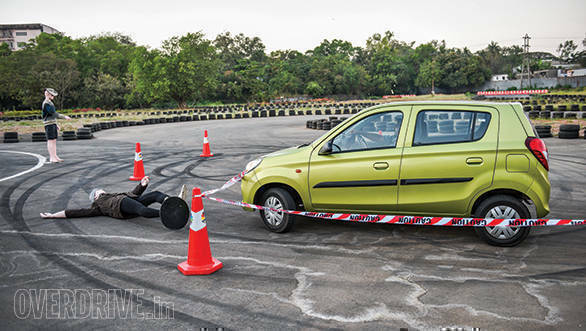 By the end of it, the Maruti Suzuki Alto 800 came out on top with a time of 9min 19s. Changing the tyre was pretty straightforward with all the tools exactly where you'd expect to find them - in the boot next to the spare tyre. In second place was the Ford Figo with a time of 10min 11s. The Ford Figo has quite a clever jack, which has a built-in slot for the wheel nut spanner and a fold-out extension rod to raise the jack. The car for which it took the longest to change a tyre was the Maruti Suzuki Baleno. The deep boot makes removing and replacing the wheel quite tough, and the jack is tucked away out of sight behind the wheel. Another car which was a bit inconvenient was the Toyota Etios Liva. The jack and spanner are located under the front passenger seat instead of in the boot, making it a bit harder to find. These might not seem like very big issues, but when you're in a hurry and in a bit of a panic, it's the small conveniences that go a long way in getting the job done quickly. Which car is easiest to squeeze into a parallel parking spot? Parallel parking is the bane of many as long as the concept has existed. It tests how well the car has been designed in terms of offering all-round visibility. But in 2017, parking sensors and reverse cameras have trickled down even to hatchbacks to the relief of many, making the task a lot easier than before. However, not all of the cars in this test have these features, and we wanted to see how much of a difference they make. So we set up a parking space measuring one-car length using traffic cones, and decided that one person - me - would try to park each car as quickly as I could. The rules were simple, the entire car should be within the boundaries of the traffic cones, and a five-second penalty would be awarded for every cone hit. 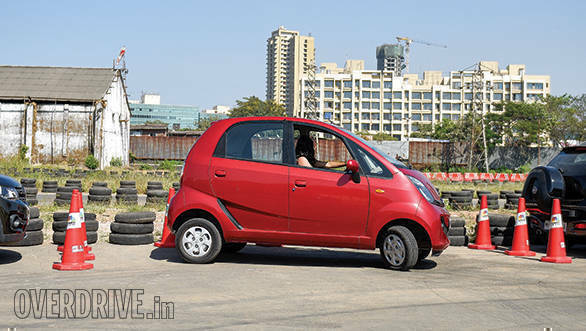 The quickest car in this test was the Tata Nano, with a time of 11.25s. I'm pretty sure I could have managed an under-10s time if it weren't for the slow response of the AMT. That aside, the car is so tiny with such a good turning radius that it didn't need parking sensors or a camera. You'd have to be really, really bad at parking to bump your Tata Nano. That said, the tiny ORVMs don't offer enough visibility. Second was the Maruti Suzuki Baleno, which I managed to park within 16.2 seconds thanks to the parking camera and sensors. However, I'll have to admit that without the camera, parking the Maruti Suzuki Baleno would have been quite a challenge because of low rear visibility. The Maruti Suzuki Alto finished third, just 0.1 second behind the Maruti Suzuki Baleno, thanks to compact proportions and good visibility. The slowest car, however, was the Ford Figo, which took me 45.56s to park. This is because there were no parking sensors, and all-round visibility was quite poor. The small rear window and ORVMs meant I could barely tell where the cones were. But parking sensors can be quite deceiving too. The Toyota Etios Liva, for instance, took me 27.33s to park because the parking sensors went berserk even when there was plenty of room. How well does the cupholder work? Cupholders have become big deal in cars these days. In fact, one might even call them a unit of measurement for storage spaces in cars! But with the kind of bumpy roads we face every day, how well do they actually work? To find out, we went about setting up our own simulation of what driving on our roads would be like with makeshift speed breakers and rumble strips. We filled up a cup to the brim and placed it in the central cupholder and drove over our obstacles at 20kmph. Whichever car lost the least water at the end of the test scored 10 points. This test is far more than cupholder design and brings to light how composed the suspension remains in tricky conditions. Surprisingly, it was the Tata Nano! Although the cupholder is inconveniently located under the handbrake far from one's reach, the surprisingly absorptive suspension ensured that just a little of the water spilled from the cup. The Renault Kwid stood second, while the Honda Jazz came in third. The worst, however, was the Hyundai Elite i20. While the low rumble strips were absorbed quite well, the i20 didn't fare too well on the larger speed breakers we had set up. The Ford Figo, which also felt a bit firm over the larger obstacles, managed to do just a little better than the i20. Which is the quickest car around a slalom course? The idea behind a slalom test is simple - to find out the grip levels and stability of car during quick side-to-side transitions. While we had initially planned to place eight cones which were 8m apart, a couple of trial runs proved that these cars weren't agile enough to comfortably complete this course. So we reduced the number of cones to six, and the distance between them went up to 10m. The timer would start as soon as the car passed a marker cone and would stop when it completed the course and came to a complete halt at a designated spot. We fixed on an entry speed of 65kmph and got cracking. Since the course was quite small, we knew that the difference in timing would be in milliseconds. So we ran each car four times and picked the best one. 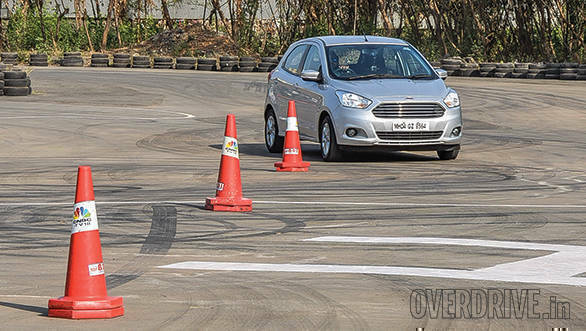 Coming out with flying colours in this test was the Ford Figo with a time of 9.73s. It's the only car in this test that completed the slalom course in under 10 seconds. The Ford Figo is easily the most nimble car of the lot here, with its reactive steering and excellent dynamics. Body roll was very controlled and the responsive turbo-diesel ensured that speeds were consistent through the course. Coming in second with a time of 10.05s is the Maruti Suzuki Baleno. The Baleno is another car with a sharp steering response and excellent feedback which gave us the confidence to push it hard. What also helped was how flat the Maruti Suzuki Baleno stayed during the side-to-side transitions. 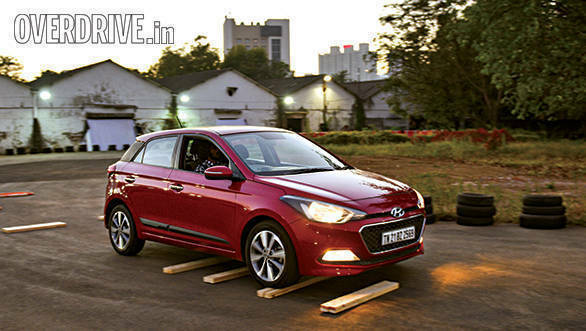 The Hyundai Elite i20, which is another good handler, came in at third with a time of 10.17s. While the dynamics in this car are impressive, it loses out on steering feedback - a problem we face with most Hyundais. The car that did the worst here, however, was the Datsun redi-Go with a time of 10.88s. 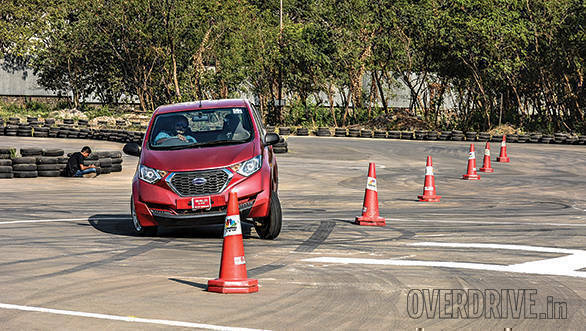 Although it's based on the same platform as the Renault Kwid, which completed the course in 10.38s, the Datsun redi-Go's suspension has been set up to be a bit softer. That along with the tall-boy design made for quite a bit of body roll through the slalom test. How good are the brakes? With the amount of traffic and pedestrians we have on the roads today, good braking is paramount to your safety and theirs. 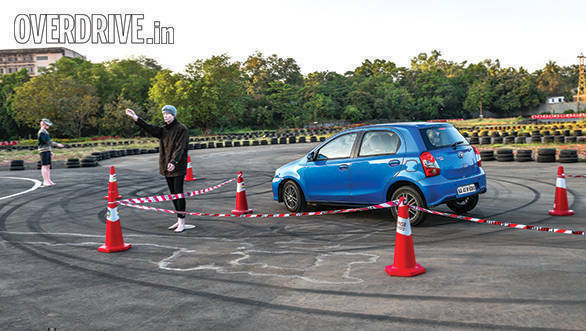 Considering these hatchbacks will mostly be driven in the city, we set up our braking test to tell us how quickly these cars got from 60-0kmph. To get an accurate measurement, we set up a VBox inside the car to give us the braking distance. The Honda Jazz managed to trump this test with a braking distance of 15.21m, while the Toyota Etios Liva came in second with 15.57m. 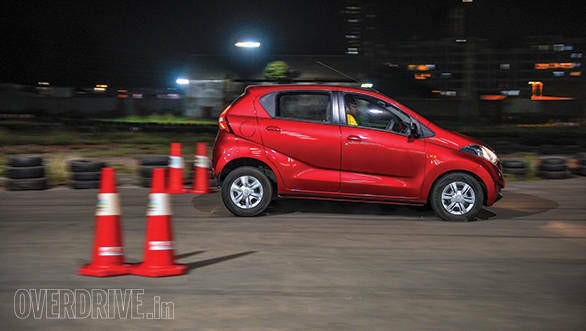 The Honda Jazz's brakes offered good feedback, while the Toyota Etios Liva's brakes felt comparatively lifeless. The Tata Nano, which gets drum brakes all around and therefore no ABS, surprised us with a distance of just 15.6m. Of course, the wheels did lock up and the car came to a screeching halt, but the short distance is only because of how light the car is. In comparison, the Renault Kwid, which has discs up front and no ABS, scored the least here with a distance of 18.66m because it is comparatively heavy. The Hyundai Elite i20 and Maruti Suzuki Baleno were fourth and fifth with a difference of just 0.01m. 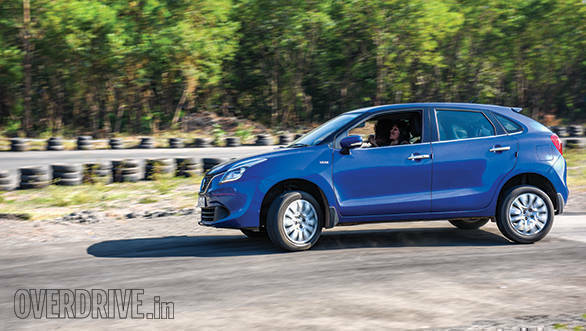 However, the Baleno's brake pedal did offer much better feel, and that's a factor which is important for our next test. While cars like the Tata Nano and Maruti Suzuki Alto outperformed some of the larger cars, there's no doubt that the feeling of stability, confidence and security in the bigger, ABS-equipped cars is much higher. How well do these cars react to an emergency manoeuvre? The collision avoidance manoeuvre is a very important test that is, in some ways, a mix of the slalom test and the braking test. Picture this - you're driving at around 65kmph, on a dual-carriage way and suddenly the driver ahead of you jams his brakes. From our braking test, we know that you have around 15m before you ram your car straight into him. Your best option is to brake hard and swerve quickly into the empty lane next to you. To simulate a similar situation, we used traffic cones as lane markings, and a mannequin at the end of the lane which we'd have to avoid. While most of the cars here managed to change lanes, we scored each one on 10 based on how confident and precise it felt in the situation. 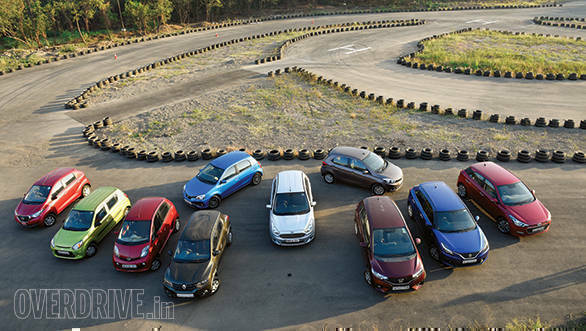 The Honda Jazz and Maruti Suzuki Baleno came out as the winners here, scoring 8 points each. Both cars have excellent brakes which offer good feedback. Their steering too felt very connected and precise which made us feel confident during the manoeuvre. The Toyota Etios Liva and Tata Tiago were next with both of them scoring 7 points. The Etios' brakes were effective while the steering and dynamics were quite impressive. However, the brakes were a bit spongy, lacked feel and didn't tell you what exactly was happening at the wheels, unlike in the Maruti Suzuki Baleno and Honda Jazz. This was the same case with the wooden feel of the Hyundai Elite i20's brake pedal. However, the i20's steering felt very artificial and disconnected, and made us feel the least confident in this test, giving it a 5. In the Tata Tiago, steering feedback was good while the brakes offered decent feel. But the only issue we had was with the brake pedal's comparatively long travel. 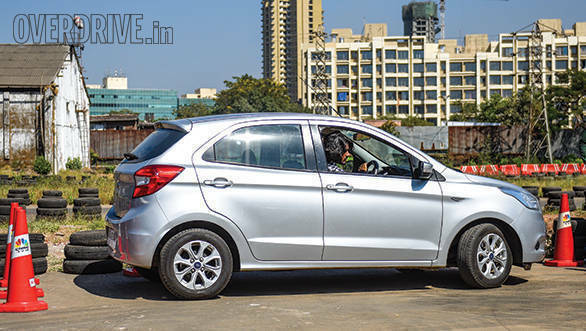 The Ford Figo, meanwhile, had great dynamics and the brakes offered good feedback. However, we had four runs and oddly, the Ford Figo's braking distance on each one was inconsistent. But at least these cars managed to pass the test. 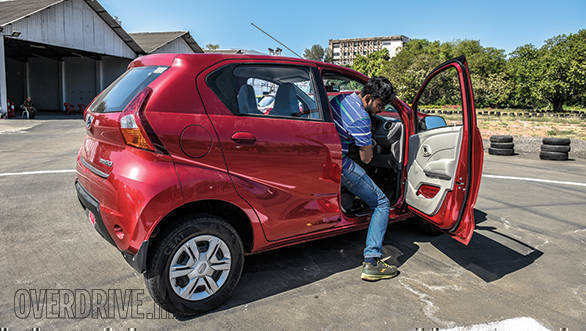 In the four cars without ABS - the Renault Kwid, Datsun redi-Go, Maruti Suzuki Alto 800 and Tata Nano - we didn't even manage to change lanes, which gives them a 0 in this test. The wheels locked up, making direction change impossible, and the car came to a screeching halt in the same lane. 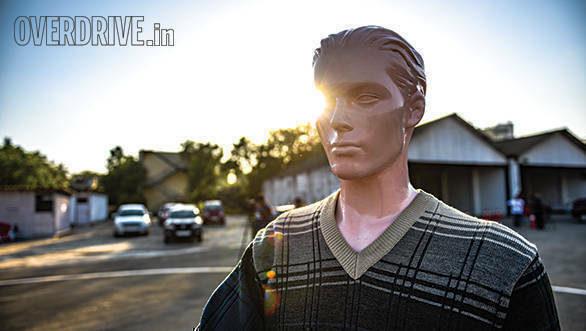 The Maruti Suzuki Alto 800 even managed to knock the poor mannequin down! It only goes to show how important that extra money is to your life when you're buying a car that offers ABS as an option. Which car's headlights illuminate the best? Headlights have come a long way in terms of technology. We've gone from halogen to xenon and now LED. But how effective they are depends a lot on how they've been set up. To see which of the cars' headlights have the farthest reach, we came up with a test that all those who wear spectacles will immediately recognise. Like in an eyesight test at your local optician, we set up a standee with random alphabets cutout of reflective stickers pasted on it. 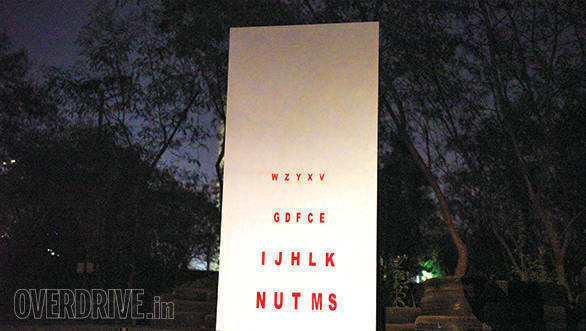 There were five lines with five alphabets each, with the smallest ones right at the top at a height of 5ft. After the braking test, we found the average distance to come to a stop from 60kmph to be around 15 metres. So to decide on how far the cars should be positioned from the standee, we factored in reaction time and decided to double the distance to a generous 30m. Seated in a stationary car after dark, the driver had no idea what the sequence of alphabets was and was asked to identify one alphabet from each line. For instance, we'd ask him for the alphabet which was the second one from the right, in the second row. If he got it right, it meant one point. Then we'd move up to the next line and repeat till he couldn't identify the alphabets. Scoring the highest, with 2.5 points out of 5, is, once again, the Honda Jazz. The driver was able to identify the alphabets from the bottom two lines very clearly, but the third row wasn't very clear. That said, he could make out the outline and hazarded a guess that turned out to be correct, so it gets the additional half a point. The reach of the Honda Jazz's headlights was quite impressive and the height was just right - not too high, not too low. In second place, surprisingly, was the Maruti Suzuki Alto 800 with 2 points, while the Ford Figo and Renault Kwid stood third with 1.5 points each. The worst of the lot, however, was the Tata Nano which scored no points at all. The headlights, which don't have a height-adjustment feature, didn't even reach the board. Instead, they were pointing at the road a few metres short of the board. Are these cars stable enough to fix your face? This was probably the most fun test we conducted. Quite unusual, but fun. The guidelines were simple. We'd set a short loop through the track with plenty of turns - sharp and wide. I'd drive the car as quickly as I could around the course while in the passenger seat, a lady had to try and apply lipstick. The results were quite surprising, because the ladies' ability to apply lipstick was so good that they didn't get a single smudge anywhere outside their lips, in almost every car! That said, they did score the cars on how easy or difficult it was to do so while being thrown around. The Tata Tiago and the Tata Nano came out on top with 10 points each, but for two very different reasons. In the Tiago, there was some amount of body roll, but since it was well-controlled, they were able to apply lipstick with relative ease. The Tata Nano, apart from being a bit soft, was too slow to invoke enough body roll to throw the women around in the car. The Ford Figo scored 9 points to take second, again thanks to well-controlled roll. In the Maruti Suzuki Baleno, Maruti Suzuki Alto 800 and Toyota Etios Liva, however, the women didn't look too impressed. I wouldn't blame them because these were the only cars in which some smudging happened. The suspension set-up on all three cars is a bit firm, which means a sudden direction change was very sharp and threw them around a fair bit. So while they were fun to drive, they're not too fun for the passengers when pushed hard. However, two cars got a big zero here from the women - the Renault Kwid and the Datsun redi-Go. It's not because they were terrible to be driven in, but because the passenger's sunshade didn't get vanity mirrors. After two fun yet exhausting days of extensive testing, it was time to tally the scores. We converted all scores to a 10-point basis and totalled them up. 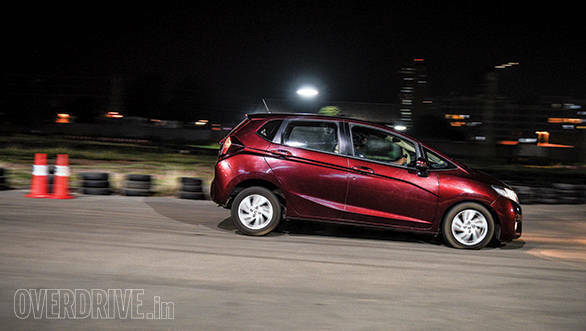 The Honda Jazz came out on top with 85.53 points out of the total 110. But it wasn't a very big surprise as we've always said that the Honda Jazz is one of the most practically designed hatchbacks for India. That said, it does come at a price. The top-end diesel variant comes up to steep Rs 11.14 lakh (on-road, Mumbai). But it's still good value for money, considering the Maruti Suzuki Baleno, which stands second overall with 72.63 points, costs Rs 10.45 lakh. But if that's still out of your budget, you have more affordable options like the Ford Figo, Toyota Etios Liva and the Tata Tiago. Of these three, the Tiago scored the highest with 70.14 points, while the Ford Figo stood second at 65.03. 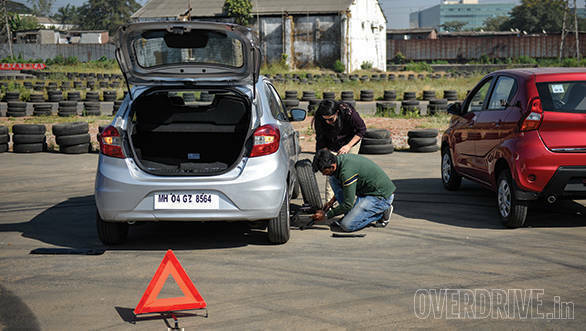 The Tiago had managed to be quite consistent in the tests, scoring between 6-7 points in most of the tests. It's quite a practical car and the fact that it costs Rs 6.69 lakh means it offers very good value for money. This, especially when you consider that the diesel Toyota Etios Liva is Rs 9.42 lakh. Coming to the entry-level segment, it's the Tata Nano that trumps the other three cars quite significantly with a score of 65.29, which is just a bit better than what the Ford Figo and Etios managed to score. It surprised by performing better in some tests than some of the more expensive cars here. It's also the cheapest car here at Rs 3.97 lakh, and it gets a 5-speed AMT. It's a fun, value for money car if you've a family of four. However, we do wish it had come with an optional airbag like the other cars in this segment. No luggage space also means it's also a strict city runabout. But if it's an affordable 5-seater you're looking for, it's the Maruti Suzuki Alto 800 that's come out on top in this test, scoring 56.43. After the Tata Nano, this is the most affordable car here at Rs 4.19 lakh, which is almost Rs 60,000 cheaper than the Renault Kwid, which scored 51.2 points. The Datsun redi-Go had scored a significantly lower score than all the other entry-level cars here with 38.67 points, and is Rs 5,000 more than the Maruti Suzuki Alto 800. 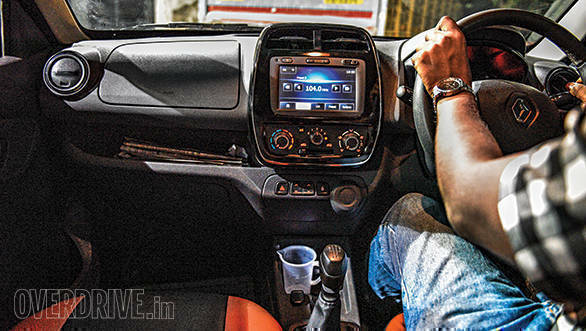 Despite being based on the same platform as the Renault Kwid, the overall design simply isn't as ergonomic in the real world, and the scores show this.